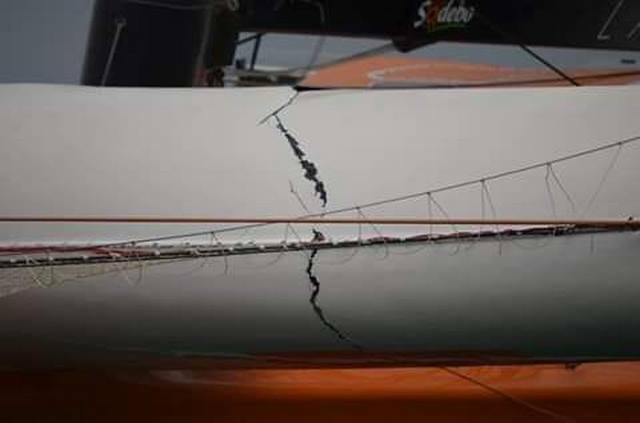 Several damages have marked these first three days of the Route du Rhum-Destination Guadeloupe. So on Wednesday night, solitaries are either refugees in a port of Brittany, en route to a technical stopover or shelter, or waiting for a final stop ... But some have already left the image of Lalou Roucayrol (Multi50) from Porto or Yann Marilley and Gilles Buekenhout (Multi Rum) from Gijon. 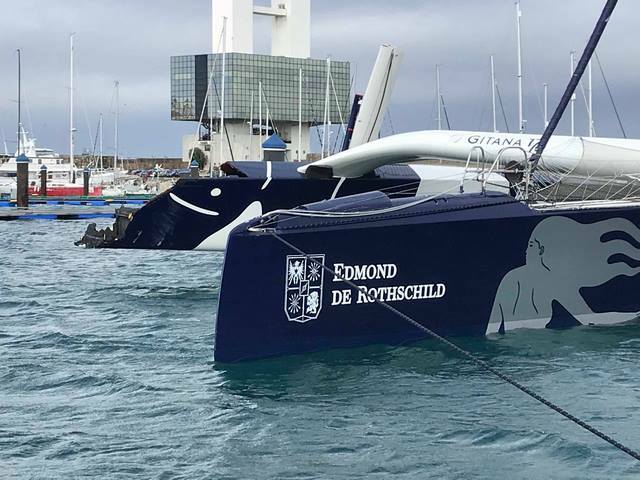 • Sébastien Josse (Maxi Edmond de Rothschild) technical stop in La Coruna. Damage: starboard float ripped off about ten meters. • Thomas Coville (Sodebo Ultim ') on technical stop in A Coruña. Damage: Damaged front linkage fairing and crack in the arm. • Armel Le Cléac'h (Maxi Solo Popular Bank IX) off the Azores. Damage: capsize after breakage of the port float. Skipper recovered by a fishing boat. • Romain Pilliard (Remade-Use it again) is on his way to A Coruña. • Louis Burton (Valley Office) is in Roscoff. Damage: waterway through the starboard foil pit. To declare his abandonment. • Manuel Cousin (Groupe Tétin) is in Camaret. Damage: Fixing defective saffron. • Alexia Barrier (4myplanet) is in Concarneau. Damage: air sensor problem. • Jérémie Beyou (Charal) is in stopover in Lorient. Damage: transmission of saffron. • Isabelle Joschke (Monin) en route to the Brittany tip. Damage: dismasting. • Romain Attanasio (Pure-Family Mary) is in Concarneau. Damage: explosion of the J3 and mainsail hook. • Samantha Davies (Heart Initiatives) en route to Brittany. Damage: structural problem on the hull. • Yannick Bestaven (Master CoQ) en route to Lisbon to repair. Damage: Fastening the mainsail. • Marc Dubos (Scouting Spirit) fled to Roscoff. • Jean Galfione (Serenis Consulting) fled to Brest. Dominique Rivard (Marie Galante-April) is in Brest. Damage: knee injury to the skipper. • Hiroshi Kitada (Kiho) fled to Lorient. • François Lassort (Bijouteries Lassort-Tonton Louis) took refuge in Brest. • Cédric de Kervenoael (Grizzly Barber Shop) took refuge in Camaret. • Nicolas Jossier (Manorga) took refuge in Concarneau. • Andrea Fantini (Enel Green Power) fled to Lorient. • Halvard Mabire (Colombre XL) fled to Bénodet. • Emmanuel Hamez (Teranga) fled to Bénodet. • Sam Goodchild (Narcos: Mexico) is heading towards the Brittany point. Damage: dismasting. • Arthur Gascoin (Up Sail & Connect) fled to Bénodet. • Olivier Magre (E. Leclerc-Ville La Grande) makes his way to Lorient to take shelter. • Loïc The Dean (Saint Cast-The Exotic Land Guildo) took refuge in Lorient. • Arthur Hubert (Audi Saint Malo-Hope for a Rum) took refuge in A Coruña. • Sébastien Desquesses (Kersia-Le Guével-Spirit of Saint-Malo) fled to Camaret. • Olivier Roussey (Obportus-Gras Savoy) is heading to the north of Spain. • Sébastien Marsset (Tohapi campsites) is on his way to Spain. Damage: Butternut outriggers. • Bertrand Delesne (bertrand-delesne.fr) is heading towards Lorient. Damage: genoa impossible to roll on the forestay. • Emmanuel Le Roch (Edenred) is heading for La Coruña. • Franck Sainte-Marie (Branec IV) fled to Camaret. • Christian Guyader (Guyader Gastronomie) fled to Bénodet. • Gildas Breton (Bo Carré) fled to Loctudy. • Erwan Thiboumery (Gold.fr for Bioniria) fled to Brest. • Charlie Capelle (Acapella-Soreal-Proludic) fled to Concarneau. • Gerald Bibot (Zed7) fled to La Trinité / Mer. • Pierrick Tollemer (Resadia) fled to Lorient. • Bertrand De Broc (Cré'Actuel) fled to Bénodet. • Christophe Bogrand (Sterec Blue Wing) fled to Port La Forêt. • David Ducosson (Air Caribbean-Caseneuve Maxi Catamaran) is heading towards Lorient. • Willy Bissainte (C 'Guadeloupe) ran aground on one of the Seven Islands. After SNSM Ploumanac'h's intervention, the boat was towed to Roscoff following a waterway. • Éric Bellion (Commeunseulhomme) took refuge at Aber Wrac'h. • Laurent Jubert (Breath Space) took refuge at Aber Wrac'h. • Nicolas Magnan (SOS windshield) took refuge Camaret. • Olivier Leroux (Real Estate Construction Art) fled to Camaret. • Jean-Luc Bizien-Jaglin (Transports Groussard) fled to Brest. 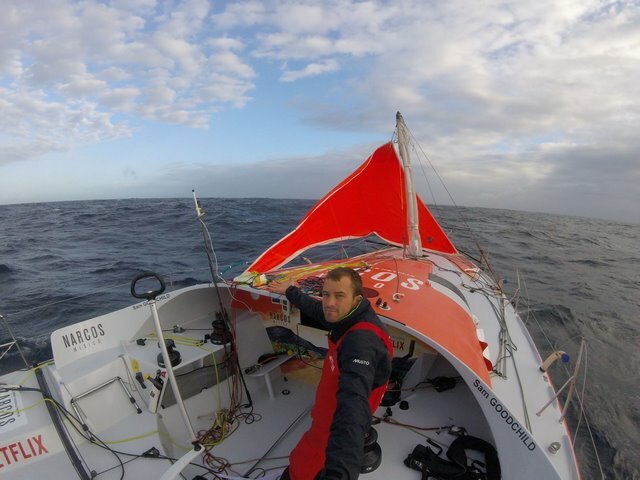 • Andrea Mura (Vento di Sardegna) is heading towards Lorient.